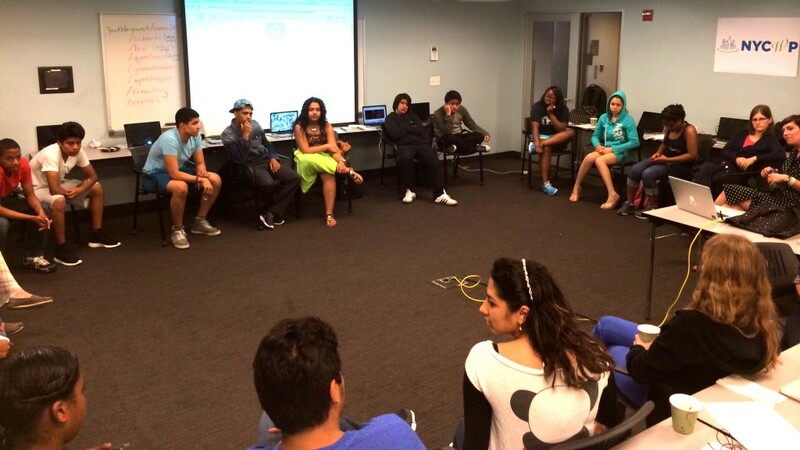 Participants in the Youth Voices 2014 Summer Program engage in a whole group dialogue and writing share. 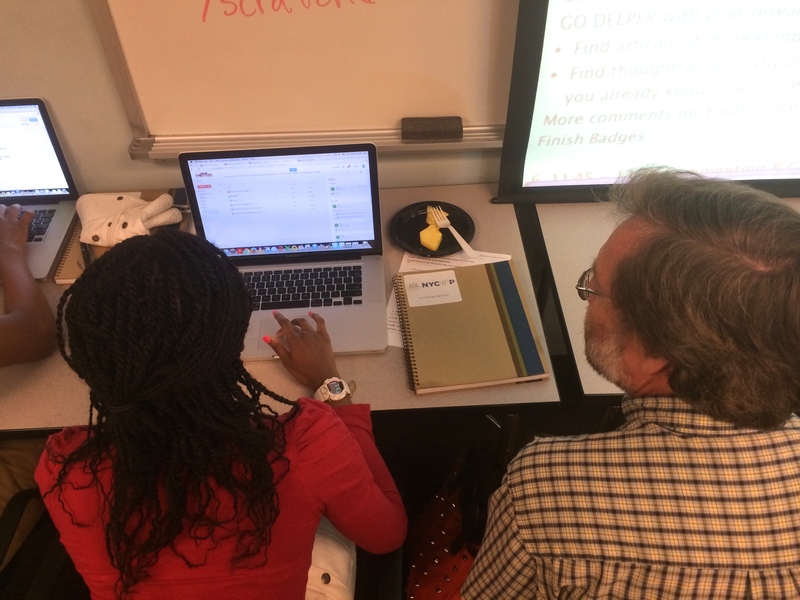 The Youth Voices Inquiry Project provides the opportunity for students and teachers to re-make themselves into social-media power users while connecting students’ academic learning with their personal passions and wider concerns. Participants are immersed in a low-risk, high-gain experience related to youth culture, interest and technology usage. Among other things, the Youth Voices Inquiry Project supports the development of open curriculum projects created by teachers, Youth-Voices-centric episodes of BronxNet’s Open 2.0 and new understandings about badging. As with all NYCWP programs, evaluation and reflection are also key components of participation. The NYCWP has received a high level of investment and support for this project from the Hive Digital Media Learning Fund of the New York Community Trust, the National Writing Project and BronxNet TV. The NYCWP believes that it is essential for teachers to be on the cutting edge of technology alongside their students. That said, it is also essential to recognize that our students have something to teach us as well: this program allows for teachers to sit alongside their students as learners and for students to take a teaching role within a group of both their peers and adults. In addition to learning about various uses of technology, their applications to youth culture and in the classroom, and the ways in which students can share and publish their writing, the Youth Voices program also engages students in activities to strengthen their sense of self, their engagement with reading and writing, and within a community of peers. 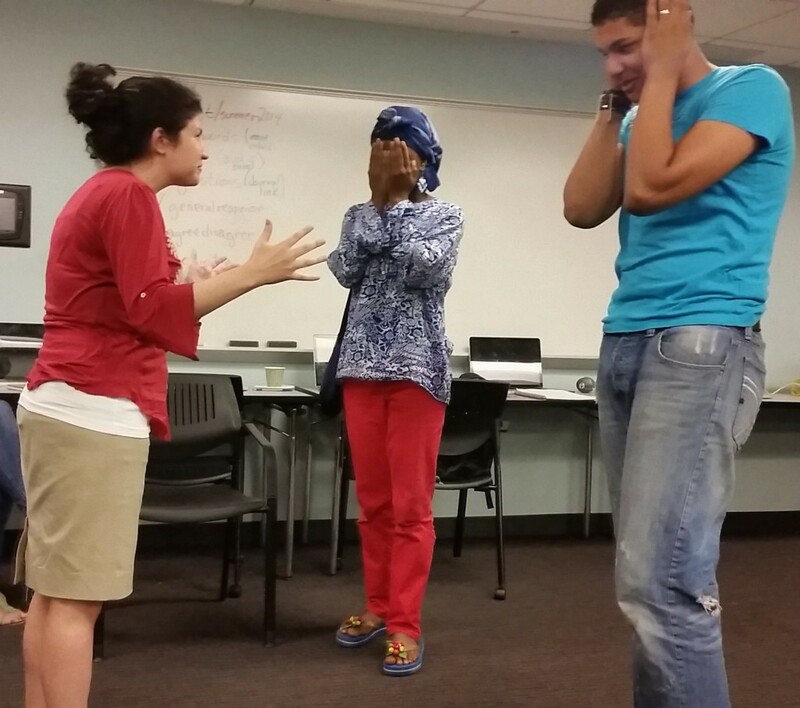 Students and teachers perform a tableaux. There are several ways to get involved with Youth Voices. In years past, we have offered a three-week Youth Voices experience, where high-school students co-learn alongside teachers in a 3:1 ratio as they investigate the ways in which using multimedia and technology can support their writing and their research into topics of their own interest. We are also able to provide Youth Voices-focused workshops and seminars at interested schools; in the past, some of this school-based work has been supported by an LRNG/Show Me Foundation grant. Schools may also choose to support this work. Youth Voices is not simply a program run by the NYCWP, but a platform that teachers can explore for use in their own classrooms and with their students. Teachers have created student “missions” on Youth Voices to engage kids with those in other schools and states, or to engage them with their peers and teachers in new ways. Curriculum for use in the ELA classroom around certain texts, such as This Side of Home by Renée Watson, and Sold by Patricia McCormick, is currently being designed and refined, and can be accessed on the site. In the true spirit of connected learning, these are open-access resources. We encourage teachers who use Youth Voices to share their own curricula there, as well. For more information, visit www.youthvoices.live and/or contact the NYCWP at admin@nycwritingproject.org.